DVD2018 report a fun video and Terms of Reference for technical publications was the big question we received this week and has given us an idea (or two)! This weeks news update from the world of technical information includes maintenance extensions for the CRJ Series right through to SDL supporting Aero Vodochody with their S1000D journey. The Bombardier CRJ series of aircraft has been granted extended maintenance intervals, what does this mean for products? Well it just goes to show that we are now in a world of increased reliability and our products are trusted to go further, longer and reliably. Mike mentions the Airbus Suppliers Conference that will be hosted later this year as well as the Adobe DITA World online conference that is free of charge to attend. The Internet of Things is the hot topic of the day and a sponsored report by Thales shows that almost 50% of products will be ‘connected’ shortly – what does this mean for cyber security and the IoT as a whole? 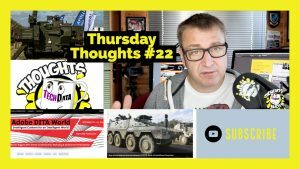 The UK has finally placed an order for 500 units of the Boxer platform, the procurement will be made via Rheinmetall Defence in the UK – Mike spent some time looking at the platform during DVD2018 and was impressed by the platforms and its professed capabilities. Is a new phrase that has emerged with L&T Technology Services being awarded a new engineering content management contract worth around $40m! What does this mean for the future of technical content? Watch out for a future “5 Minute Friday” Mike will look at this new buzz word in detail. In the TDW News This week, we have released the latest A2Z of S1000D “F” and free account holders will be able to access the next in the series shortly. “Is your supplier [deliberately] holding you back?” – My next article for the TDW Magazine – I am going to comment on some trends I have seen in the market! The TDW Magazine is in the final throws of development with articles on S1000D, ShipDex, Simplified Technical English, Supportability as well as a couple of photo-based articles on our trips to the Farnborough Air Show and DVD2018. A notice that our latest podcast was delayed due to technical reasons, we were due to interview Scott Able AKA “The Content Wrangler” but technology let us down – we will bring you this interview very shortly! TDW-Live is in full speed ahead mode with multiple project teams and delegates attending this year – make sure you book your space for this years TDW-Live event. Will Mike be at the Support Chain Seminar? Can you add my ‘C’ to the A2Z of S1000D? Can TDW help us put together some TOR’s for technical publications contracts?